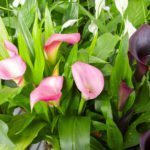 We have a calla lily that was given to us in a container. Should we move it out of the sun? It was doing very well, but the past few days the leaves have begun to yellow some and the blooms are turning brown. It does get morning and early afternoon sun; and in Arizona, the temperature is beginning to rise. Moving it out of the sun will help. It needs more water and a shadier spot will reduce its water needs some.